Event Booking Calendar is an easy to use PHP event registration software for selling tickets online, managing events and registrants. Create and customize your own event registration system without having an extensive knowledge of PHP. With Event Booking Calendar you can easily integrate a visually appealing and interactive calendar on your website that will enable applicants to find upcoming events, register and pay tickets online. The booking calendar encourages users to sign up for events and instantly drives high conversion rates.The event booking system provides 3 optional front-end views - calendar, event list and a monthly view. 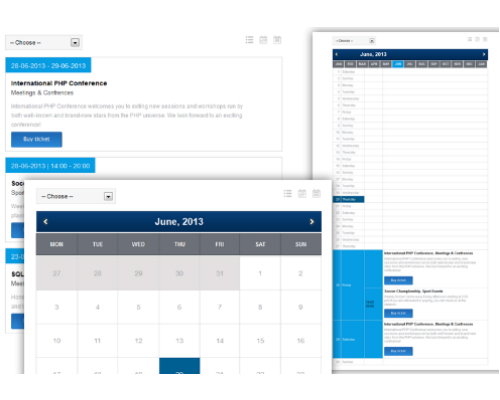 You can easily customize the design of your own event registration system using an external CSS files and modify functionality by editing the source code (Developer License).The Event Booking Calendar provides an easy admin panel where admins can add an unlimited number of events and categories, manage all aspects of the registration process, customize theâ�?��?look and feelâ�?��?� of the calendar or translate the event registration system. Follow a simple step-by-step install wizard to install the event registration software onto your hosting account. Then a single category or event integration code will be available for you in the back-end. Just copy andpaste the code into the web page body. Webmasters can use the Event Booking Calendar for work-projects and modify the software to fit their own or their clients\' needs. With a developer license you receive the source files of the Stivasoft event registration system and you can modify the PHP code.